On Friday a small group of Greenwich FROG members visited the undercroft beneath the Queen Anne Block of the Old Royal Naval College. 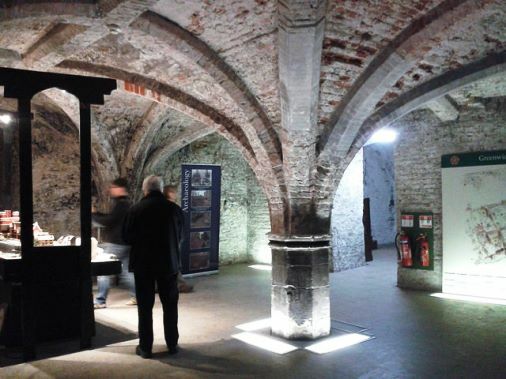 The undercroft is the only surviving land side structure from Greenwich Palace. We knew it was built from bricks and we have long wanted to visit to see how it compares to the brick structure on the foreshore, which we strongly suspect is the remains of the Tudor riverwall. The undercroft was a later addition to the Palace, constructed underneath the timber-framed Great Hall in 1604. The Great Hall ran parallel and to the south of the chapel, at the eastern end of the Palace. 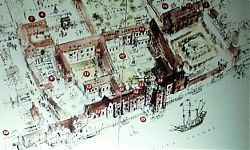 The drawing of the Palace from an old interpretation board which was in the undercroft, shows the Great Hall at number 12 and the chapel on the river front at number 13. Part of the chapel was excavated in 2006 by Julian Bowsher, under what is now the car park between the Queen Anne Block and Park Row, and you can read his excavation report here). 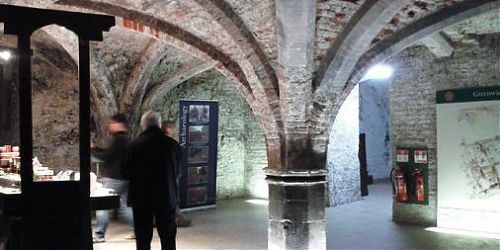 The undercroft is formed of five and half red brick bays, four of which form a square room, with a central octagonal pillar. The whole structure is fantastically constructed, with a lot of attention to detail for what was essentially storerooms. The vaulting is ribbed with chamfered bricks, and the stone pier bases have moulded caps. There were definite similarities with the foreshore structure, and we took some measurements of the bricks to compare. 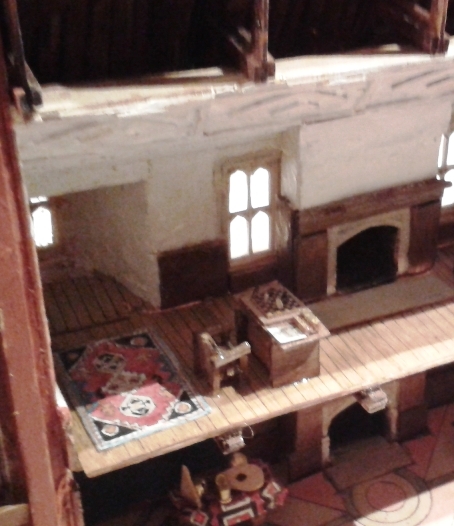 Also in the undercroft is a fantastically detailed model of Greenwich Palace, based on Wyngaerde’s panorama of 1558. 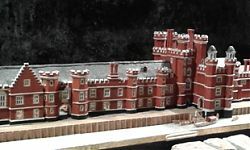 The model was made to scale, by architect and mudlark, Nicholas Wood. 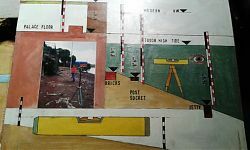 He used information from the 1970’s excavation of the Naval College courtyard, and the Thames Archaeological Survey in the 1990s to calculate the scale of the model. There’s more information about the model in this newspaper article. Nicholas carefully researched the construction of the Palace, including the roof construction and location of the chimneys. 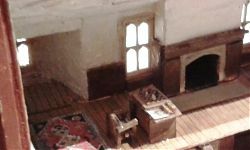 And he worked with a dolls house expert to furnish the model, with a wonderful kitchen and even a chess game in progress. 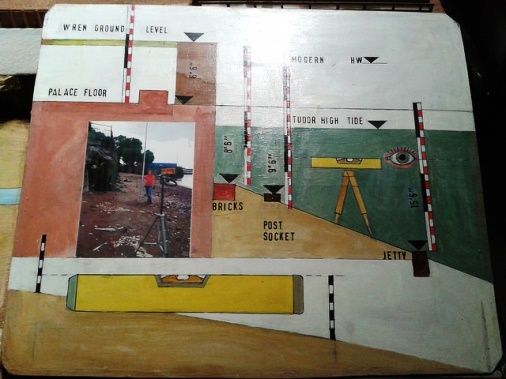 The model has an accompanying series of interpretation boards about how he went about constructing the model. These included tantalising pieces of information about the Palace and the excavations which we’d not seen before, such as a photo from a level survey, to show how Nicholas calculated the river wall height, and what looks to be an unpublished copy of a plan from the 1970 – 1971 excavations. We have plans to track down some of the information that he used, as it will help us with our interpretation of the foreshore. There is more information about the undercroft on the listing entry for Greenwich Palace (scroll down, it’s in the details section about two thirds of the way through…) and all my photos from the visit are on Flickr here. Many thanks to Jane Sidell and Kieran Kintrea from the Old Royal Naval College for arranging access.